30 June or 31 December – which date causes you to have that uncomfortable feeling in the pit of your stomach? Many feel pressured to ‘burn the midnight oil’ to get things finished by these key dates. Many need to work longer hours and / or lead teams who have been working for extended periods towards a key outcome or deadline. The reality of our busy work lives means there are times in the year when we work with extreme peaks and on the rarer occasions, hit an occasional trough. It also offers some suggestions to help manage the (rare!) downtimes. We thought it might be a good time to remind people of this document, and let our new ‘monthly leadership tips’ receivers who weren’t receiving the newsletter last year, know about it. Click here to access the document. 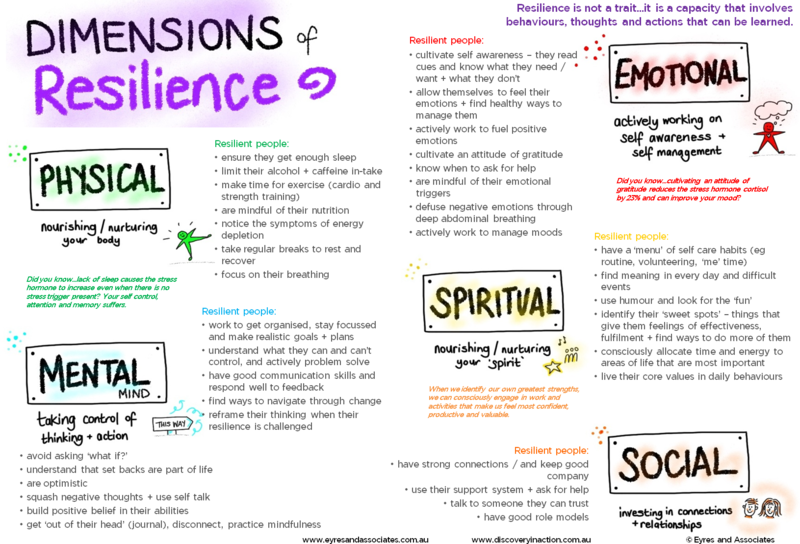 Since publishing this tips and hints guide, we have created a Dimensions of Resilience model that we reference in our 2 half day program entitled Enhancing your Resilience. This model shares practices and habits that resilient people tend to demonstrate – across 5 dimensions : physical, emotional, mental, spiritual and social. Feel free to print this out to get some more tips on enhancing your wellbeing. TIP : Why don’t you pick one thing from each of the 5 dimensions to focus on in the coming weeks. The start of the new calendar or financial year is a good time to set goals…set some goals to help yourself be your best over the next year – personally and professionally! If you are interested in finding more out about our Enhancing your Resilience program, click here. This course is for any employee who wishes to improve their resilience : helping them to ‘survive’ and ‘thrive’ in a busy and often changing workplace. It could be run as a ‘public program’ within your organisation, or with your team. 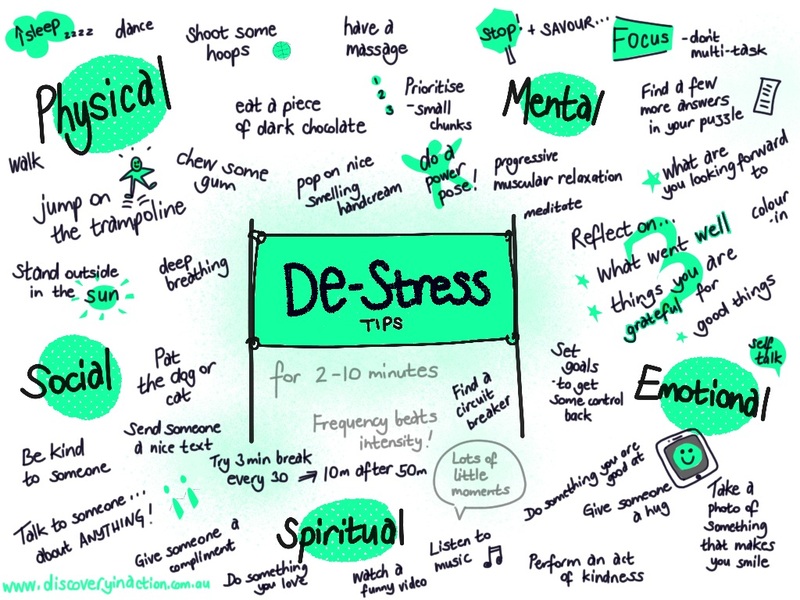 February 2017 update : we have recently made a visual with ideas to help manage stress.